Shaped like a minaret and covered with beautifully-intricate pierced Islamic motifs, this mantel clock is an exquisite piece of French Orientalist design. The clock stands on a square base, which rests on four toupie feet. 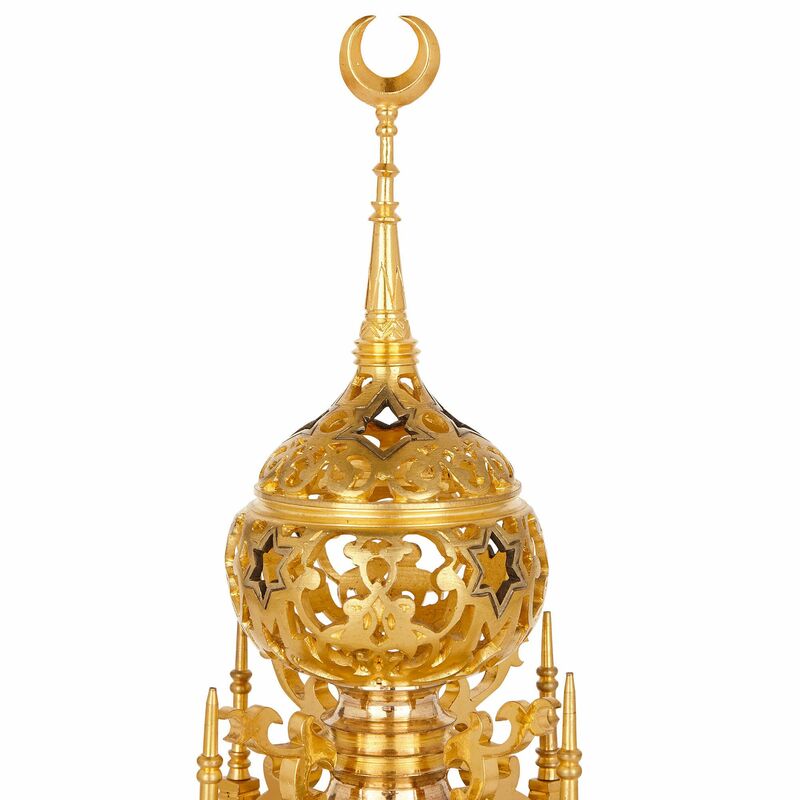 The base is fringed with an Islamic style pierced zigzag pattern, created by a combination of silvered bronze pointed forms and gilt bronze trefoil-tipped triangles. Above, the body of the clock is square-shaped, and is raised above the base by four outward-curling feet. Curling buttresses extend up from the feet and meet the corners of the clock body. The bottom of the body is edged with a gilt bronze frieze, with pierced arches with trefoil-shaped profiles and pointed ends. 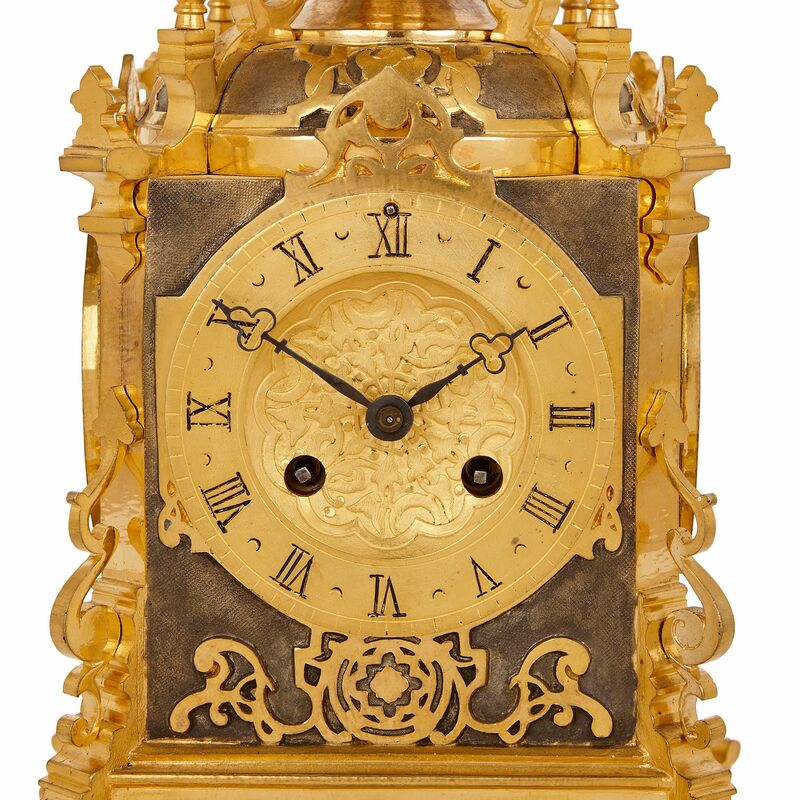 The clock body features a central, circular gilt bronze dial, with Roman Numerals and black hands, with pierced trefoil ends. This circular dial is fitted with a pierced, dome and set against the square silvered bronze case, which is mounted below the dial with gilt bronze swirling, foliate forms. 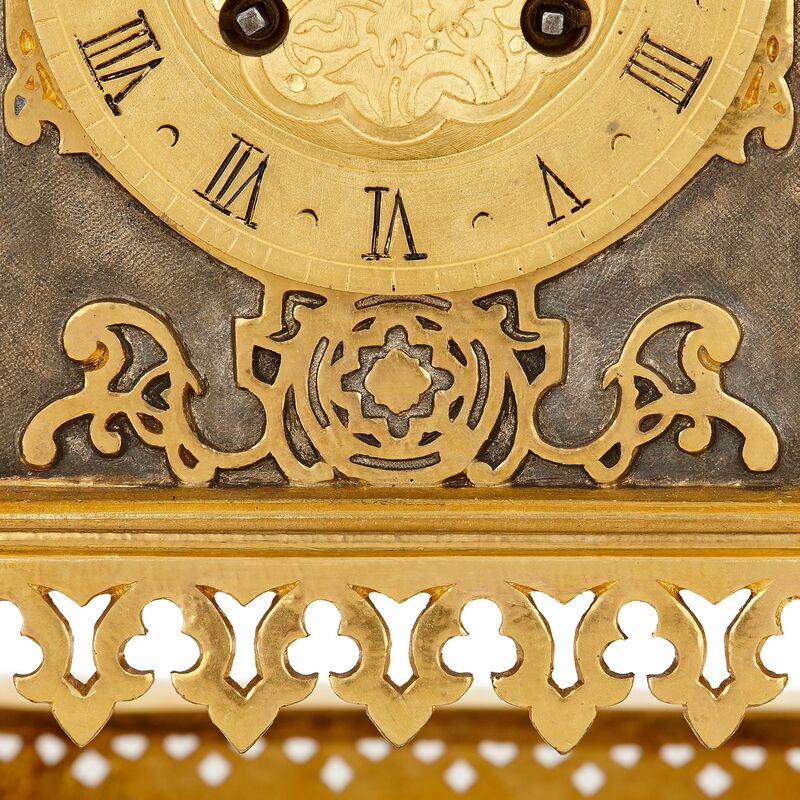 The sides of the case are similarly decorated, but with central, pierced gilt bronze medallions in place of the clock dial. 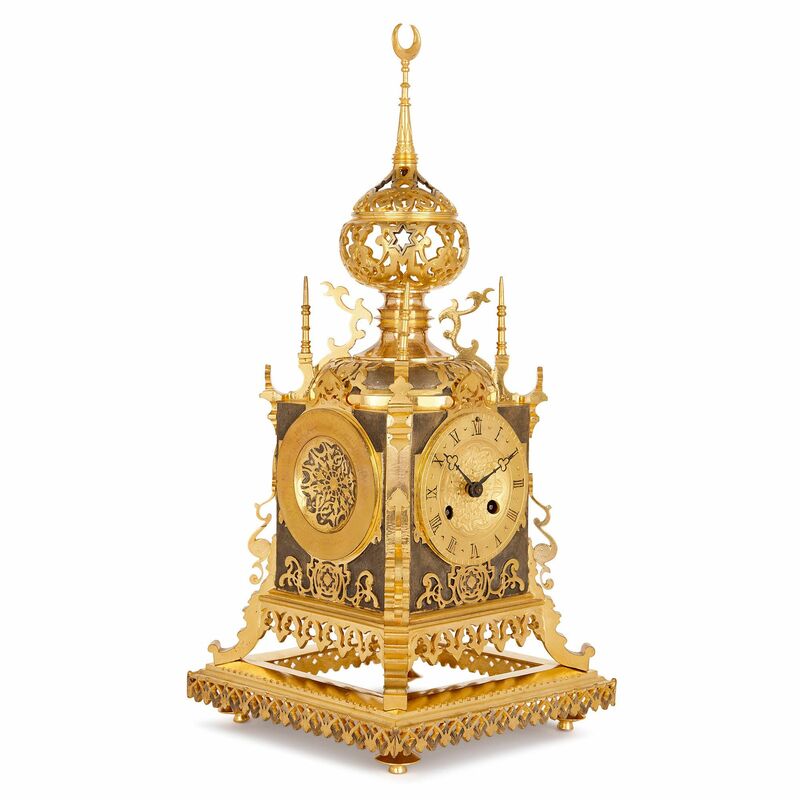 The four corners of the cube-shaped clock body are topped by pointed, gilt bronze finials. Between them, surmounting the square clock, is a silvered bronze onion dome, mounted with pierced, gilt bronze foliate patterns. Above this, there is a second dome, which is pierced with swirling and entwined vegetal shapes and stars. This is topped by a tall finial, with a crescent moon tip. 'Ch. Oudin, Palais Royal 52' is stamped on the back of the clock dial. 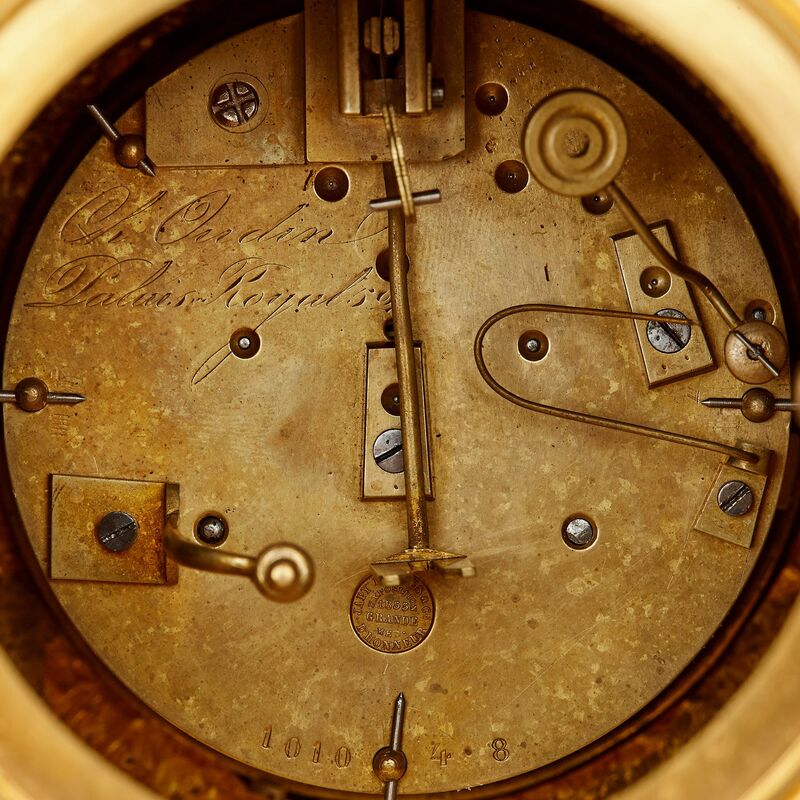 Charles Oudin was a famous French horology firm, based in Paris in the late 19th Century. Oudin had a workshop in the Palais-Royal, a fashionable shopping district in Paris. The mark '52' records the address on the Palais Royal where Oudin set up shop in 1812. The Oudin company was very successful in its own time. They took part in major shows, including the Exhibitions of the Products of French Industry in the early 19th Century, and the International Exhibitions of the 1860s. 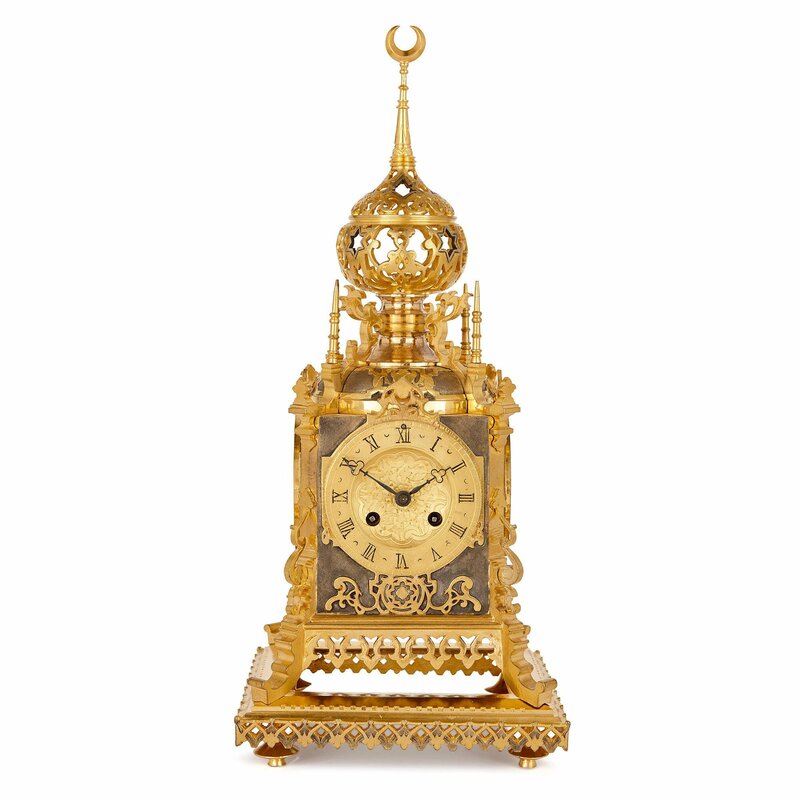 In addition to this, Oudin supplied clocks to the Imperial Navy, and French and European rulers. Oudin items can be viewed in important collections and exhibitions across the world, such as the Metropolitan Museum in New York and the British Museum in London.